Hello, I am working on the same civil drafting project from Penn Foster that I have read through some of these threads. I have completely finished plate 2 and my instructor informed me that everything was correct. For plates 3 and 4, I have already created my grids according to the instructions given. Everywhere your cut line crosses an existing and/or proposed contour or spot elevation plot the points on your grid. Thanks for the response. Are they supposed to be projected or plotted on the grid? Meaning, After my grid is completed, I need to scale it up to match my plate 2 drawing, right? And then project the points like you indicated. What happens where the driveway starts to curve? Treat the curve like a straight line. You have a point of curvature and a point of tangency and both are stationed so you know can calculate the distance. I believe the instructions are to create the grid and plot the points but I'd have to look to verify. BTW....I did not take the course. I'm just filling in for someone who did. The instructions do indicate "when plotting the drawing". I have my grid set up starting 0+00, 0+50, 1+00, and so on until 4+00. If I treat my centerline as a straight line, then I can definitely calculate and plot where everything is supposed to go ( start, curb, row, pc, pt and end) and I can calculate where the existing contours cross the centerline. I assume that existing contours will appear as a slop on my grid, and stationing will just be vertical lines on my grid with a label at the top? I am still not understanding how I would plot the new contour lines? I think the driveway is level isn't it at an elevation of 180 from end to end. The original contours go from 180 down to 130. At the beginning and end of driveway is 180, then moving towards the center of the center of the driveway, each end goes down to 170, 160, and down to 130 near the middle of the driveway. In essence you have two centerline profiles. One for the existing contours and one for the new contours. Where the new profile is higher than the old profile that area will have to be filled in with soil. Where the new profile is lower than the old profile that area will have to have soil removed. Cut and fill. Got it? And don't forget the drainage pipe. It has to be shown as well. The invert of the pipe is somewhere around the 130 elevation I believe which is well below the grade of the new driveway. Could you look at this drawing to see if I am on the right track? There is no cut...only fill. I assumed you were working on the centerline profile for the driveway. You're not; you're working on a cross-section. A slightly different animal. The driveway doesn't reach elevation 185 at the turnaround? BTW....your tree symbols would be fine if the trees were meant to be shown in elevation but they are being shown in a plan view. Not too many trees have that shape (like an arrow) unless a hurricane knocked them over. Thanks, I will definitely change my trees! Ok, I know what to do for my section then...but I am once again confused for my profile. What I was plotting was where the contours crossed the centerline. Maybe our terminology needs to be adjusted. The term "centerline" would be used to describe a line that runs down the length of a road or, in this case, a very long driveway. 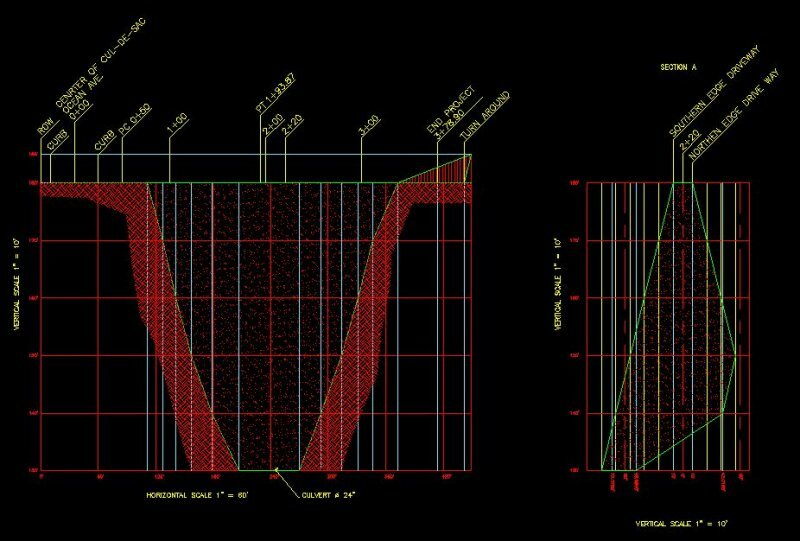 A section line is one that is arbitrarily placed to indicate where a section through a road or a driveway might be useful. Take an Exacto knife and cut off one of your fingers about midway from the tip. Turn you hand towards you so you can see the end of your finger where the tip used to be. See the muscle and the end of the bone? That would be a section. In a few minutes I have to take a ride somewhere. I'll be out of touch for a while. However, if you have any further questions go right ahead and post them. I'll see what I can do to answer them later today if possible. I understand what a centerline and section is. Obviously I am not understanding what a profile is. On my attached drawing, the left hand grid is for the centerline of the driveway. The left hand of the grid is the start (center of cul de sac) and going horizontally is stationing at every 50' (also indicated is the curb, pow, pc, pt and end of driveway) . Vertically is the elevation, starting at 110 going up to 190. 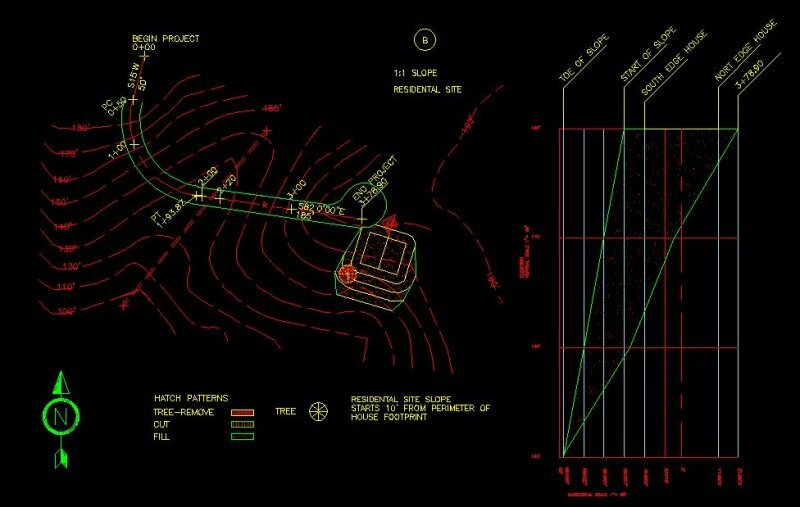 What I plotted on this grid is the culvert and the points where the elevation crosses the centerline in relationship to where it is lengthwise on the centerline. For example @ 180 elevation it crosses the centerline 75.94' away from the cul de sac and another 337.52 towards the end of the driveway. So do you or anyone have an image of what plates 3 and 4 are to look like? You can find images of plates 3 and 4 in one of the other civil threads if I am not mistaken. I have seen lots on plates 1 and 2 but not for 3 and 4. Can anyone tell me what the labels on section A an B say? They are too blurry for me to read and Im not sure how to label my graphs horizontally or vertically.